The semifinals are set as top 4 teams of the regular season overcame their opponents in the quarterfinal series. Naft Abadan overcame Zob Ahan 75-42 as Mohammad Hasanzadeh top-scored for the winners with 18 points and Aren Davoudichegani (185-PG-86) netted 16. Gorgan edged Mashad 97-59 to sweep the series as Amir Khandanpour stepped up with 18 points. 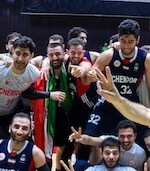 Petrochimi demolished Army 114-61, while Chemidor beat Pegah Iran 84-70.